Remember him. The heartbreaking photo that seemed to define the ravages of the war in Syria. 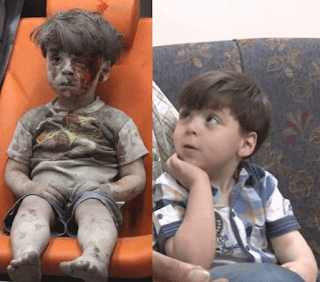 This is the Syrian boy covered in blood, whose photo went viral last year. It showed the tiny toddler covered in dust and blood sitting wordlessly in an ambulance with a lost look in his eyes. But now he has been captured in a recent photo and he seems to be in a much better place, than that horrific time. A survivor of bombs. Omran Daqneesh was just five years old when he was pulled out of a rubble after his house was bombed in Aleppo last year. His older brother was not so lucky. Seeing that photo of him in an ambulance covered in dust and blood caused global outrage and above all else, it made people aware of scary reality unfolding in Syria. The symbol of war has now become a symbol of hope. Omran, whose pictures showcased the horrors of the Syrian civil war, has appeared publicly for the first time during a TV interview. He looked a far cry from his world famous photo, in a footage that showed him sitting on his dad’s lap with his sister beside him looking healthy and happy. Omran's family were interviewed at their home in Aleppo, which is now under control of forces loyal to Syrian President Bashar al-Assad. He had lost his 10 year old brother in the same bombing last year. Even as the war rages on, seeing the before and after of this little boy makes us understand the vast and shocking difference between war and peace.